Thin profile light boxes from ILM Light Boxes offer cutting-edge, energy-efficient technology combined with practical application. Our product delivers unmatched uniform edge-lit illumination. Everything that we manufacture is made to order based on the customer's specifications. We specialize in custom sizes. Our extrusion is expertly cut and assembled in-house to create any size up to 4' x 8'. We offer a standard 1-15/16" and an ultra thin 1-1/8" profile. Both models provide bright, color consistent illumination, are competitively priced, and have a quick turnaround time. Production on most orders is completed within 10 business days. We offer in-house design and engineering services so you can utilize the light boxes in various applications. Our personalized customer service team is here to help you in the design and ordering process. The magnetic system allows for an easy one-person poster change so you can quickly modify images, update in-store promotions, and revise menu items. Let our graphic designer help you create a custom image to promote your brand or we can print artwork that is provided. Either way, changing the poster is fast and affordable. Backlit LED light boxes from ILM are manufactured in a variety of sizes and styles to accommodate your custom display needs. They are a great way to illuminate large scale graphics and make a BIG impact. We have interior and exterior solutions depending on your project. Everything we manufacture in our Florida facility is made to order based on the customer's requirements. We will work with our design and engineering team to create a one of a kind display based on your project needs. The light boxes can be utilized for numerous media applications including retail environments, store fixtures, trade show displays, airports, malls and sports arenas. If you are working on one box or a large roll-out, each light box is manufactured to meet your needs. We have 4"-6" deep single face profiles and double face LED or fluorescent boxes available. Depending on the size and design the boxes have magnetic faces, removable retainers or large scale flex face prints. We are happy to come up with a custom solution to enhance your project. Whether you are looking for a non-illuminated, thin profile or backlit display we can offer creative solutions for your space. Fabric offers a strong color saturated image with glare-free graphics and noise dampening effect, as well as easy replacement to keep your display current. Our seamless fabric graphics are fire rated and use water based inks for emission free and odorless displays. 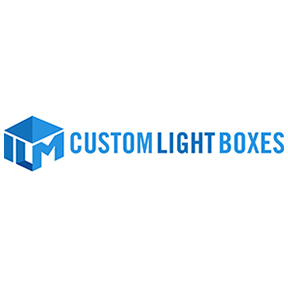 The fabric box is available in a thin profile 1-1/4” deep profile and a 4” deep backlit option. If you are looking for a high impact display the fabric light box is a great solution. The image bleeds to the edge of the frame creating the largest visual opening on the market. ILM is proud to introduce our new front loading snapframe LED light box. The four sided snapframe with mitered corners makes changing out graphics a snap! It’s a sleek, contemporary and economical option for your display needs. The box is available in two ultra thin profiles - ¾” or 11/16”. The front loading box can be easily customized as well. We can accommodate any size and color finish up to 4’ x 8’. Our unique in-house manufacturing capabilities and 60,000 square foot facility allows us to create a vast array of signs that can be used in various interior and exterior applications. No matter how large or small the project is we can help create a custom solution to meet your needs.